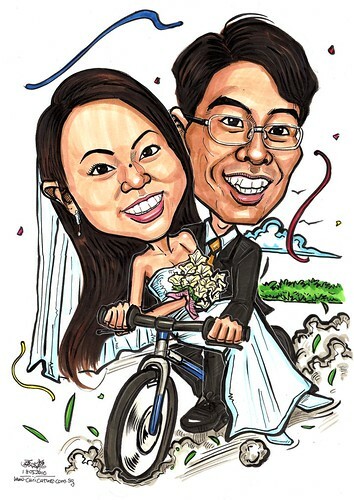 I am interested in getting a colored caricature in ink & marker as a wedding gift for my friend. (3) The groom likes cycling. One of the pictures enclosed show his bicycle. It would be great if you would be able to incorporate the bicycle into the picture. (4) The bride likes white lilies. It would be great if you would be able to incorporate that into the picture as well. I would like to have it in A3 size hot lamination, with A3 size high resolution scanning on CD, as well as a self-inking rubber stamp." 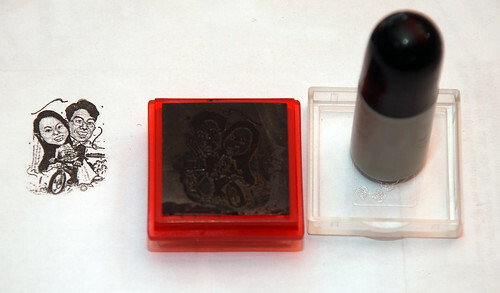 Caricatures printed on black ink rubber stamp.